« Dragon Age: Inquisition – Who to Support at the Winter Palace? Oh hey, it’s N7 day! Some part of my subconscious remembered, because I put on my N7 hoodie after not wearing it for a few days. Me with my Mass Effect merch! Censored my face because I couldn’t be arsed to make myself presentable today. In the end, it took longer to achieve satisfactory censorship than it would have to brush my hair and slap on some powder. Selfie generation, I am not. Both items from the official Bioware store. Official artworks (they call them lithographs which I guess describes how they are printed? My lack of art knowledge is embarrassing.) are limited editions as far as I can tell. This one was a gift Ed gave me years back. The most similar one currently available is the Mass Effect Saga Lithograph (which looks pretty cool, I must say – I’d buy it for our gaming room Ed if shipping to Canada wasn’t so outrageous). And the hoodie in the store today that is closest to mine is this one. I see a lot of questions about merchandise quality and I have to say, my hoodie held up beautifully over the years. Yeah, the paint has thinned a little and I’d probably buy a new one if convention attendance was in the cards, but I wear it almost daily at home and I’ve washed it quite often (can’t have me perpetuateing stereotypes about unhygienic gamers). It’s still ridiculously comfortable, the inside is still surprisingly soft and it still looks good enough to please me when I see myself in the mirror. Only problem I have with the official store is that there’s no Canadian site, which means prices are doubled due to shipping and duty fees. If I were to ask anything of Bioware, it wouldn’t be a perfect Mass Effect game (although I admit that would be a close second) or more role-playable Dragon Age protagonists (third), it would be a more cost effective way for us Canadians to buy their merch. They could even just make a little front in the reception area of their headquarters. I GO TO EDMONTON ALL THE TIME! I WOULD SHOP THERE! There was a video, it showed people involved in making the game (as well as a few fans – which I loved, I’m especially happy they showed a clip of Biofan because I’m kind of obsessed with his videos these days) and they were all sharing their wonderful experiences. The interviews look new though. Or at least, I hadn’t seen them before. Despite being exactly what you’d expect, I still enjoyed watching it and savouring the warm fuzzies. There’s some featured artwork, in high res even(!) so you can take them to Walmart for printing without having to spend an arm and a leg on shipping. 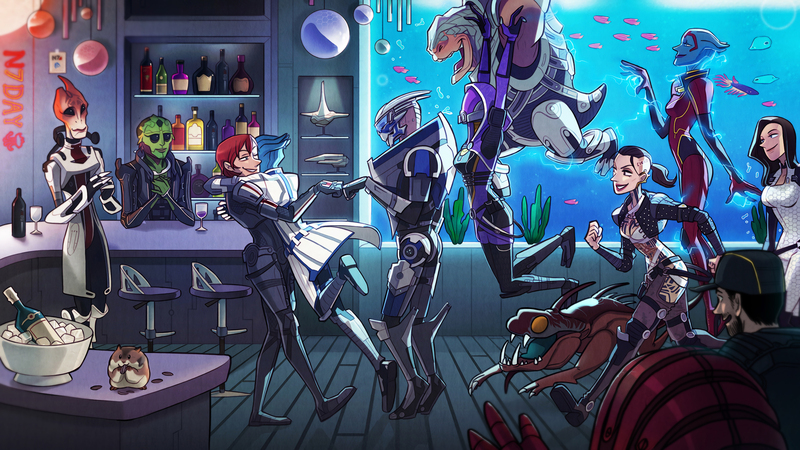 I’m hungry for moar and moar artwork – it’s funny I never cared much for paraphernalia in the past yet lately I can’t get enough of Mass Effect related art – but I am very impressed at how excellent yet radically different their selection was. The one by Unoobang is my new desktop background. It totally captures the atmosphere of my Normandy. And that Space Hamster! Buried in the middle of the N7 day page is the Mass Effect Archives. I almost missed it, thinking I’d talk a bit about the video and the art, then the streamers even though I don’t watch streamers, then hit the publish button. In the nick of time, I noticed the link. I clicked it and OMG! WHY HAVEN’T THEY MADE A BIGGER FUSS ABOUT THIS? There’s nothing on the Bioware blog and even the Mass Effect subreddit was wondering if this was a new thing or an existing feature we’d all missed. I’m a pretty big fan of the Dragon Age Keep. Sure, there are a few bugs and it can’t keep track of everything a save file can, but overall, it’s a great way to overcome game engine and console generation barriers. Plus the art is lovely and I had a lot of fun filling it out the first time. Actually, I still have fun messing with World States, and while I haven’t done so yet, I like how if you want to explore a specific world state in Inquisition, you don’t have to put in 100+ extra hours into the earlier games. So I’m really excited about a Mass Effect version (I’m positive that at some point, I have wondered out loud why there was no Mass Effect Keep in production, but as usual, no written record). It’s not as straightforward as the Keep (or maybe I’m just so used to it that I don’t notice the gaps in userfriendliness anymore) but perhaps I would have had an easier time had I used the tutorial. The Keep also doesn’t have an “upload appearance” feature, which is what I had the hardest time figuring out. I hope this means we’ll be getting new Mass Effects in the future, and Mass Effects that care about our old Mass Effects (although the FAQ does specify that the Archives won’t affect future games) – unlike most vocal fans, I don’t think Andromeda was a death sentence and I do think we’ll revisit the universe, its world is so juicy and there’s an abundance of stories sitting there, waiting to be told. It would be way less time and money to return to Mass Effect than to create a brand new world. I’m patient and I’ll be here, playing with my Tapestry while I wait. This entry was posted on November 7, 2017 at 6:33 pm and is filed under Mass Effect. You can subscribe via RSS 2.0 feed to this post's comments. That lithograph looks amazing. I wish they still had something like that available. Yeah, it’s sad how limited all the official artworks seem to be. I wonder if there’s more selection if you’re lucky enough to make it to a convention. It was funny when I got my lithograph framed, the owner and staff of the framing shop were reeaaaally interested, asking me what the artwork was from, then all sorts of questions about the game. I wonder if I helped create new ME fans that day.